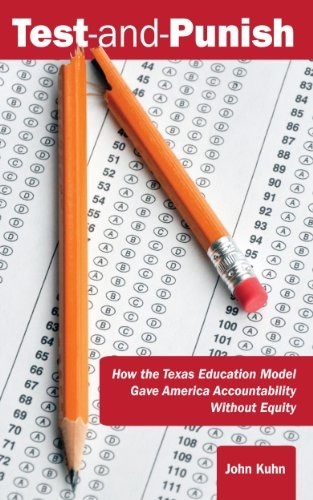 Test-and-Punish: How the Texas Education Model Gave America Accountability Without Equity by John Kuhn follows the history of the modern education reform movement from its roots in Texas. While the tone is strongly one-sided, John makes a compelling case for reforms that diagnose-and-support and finds a way to finance schools in a more equitable manner. If you haven’t joined his battle, it may be time. Click at the bottom of any page to purchase this powerful argument. John Kuhn is a public school administrator in Texas and a vocal advocate for public education. His Alamo Letter and YouTube videos of his 2011 speech at a Save Texas Schools rally went viral, as did his 2012 essay The Exhaustion of the American Teacher. 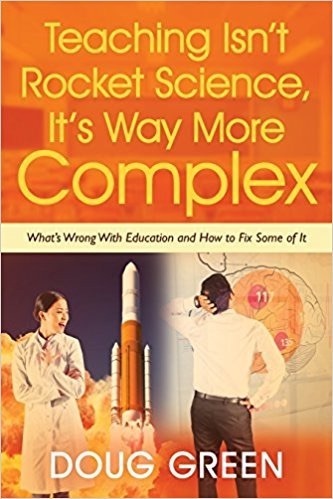 He has written two education-related books, 2013’s Test-and-Punish (Park Place Publications) and 2014’s Fear and Learning in America (Teachers College Press). Although this book talks a lot about Texas, it is actually a book about national education policy. It’s focus is the test-and-punish craze that has dominated education policy-making in the United States since former Texas governor George W. Bush worked to introduce No Child Left Behind legislation. John sees this law and subsequent iterations as a series of big mistakes. This would include the use of data to punish schools, teachers, and students; the reduction of school quality to a simple menu of labels; vacating the concept of supports in favor of consequences; the misuse of test scores to force privatization; the implementation of accountability algorithms to attain political goals; the increasing investment of limited funding and time for the sake of standardized tests; and the sidelining of teachers in favor of lobbyists and politicians in designing accountability legislation. He takes heart in the fact that a band of passionate parents and feed-up teachers, board members, and administrators are fighting back, and he sees this push back to the reform movement spreading to other states. This entry was posted on Thursday, January 8th, 2015 at 7:12 am	and is filed under Book Summaries, Education Books, Leadership Books. You can follow any responses to this entry through the RSS 2.0 feed. You can leave a response, or trackback from your own site.